We are very pleased to have been commissioned by the Office of the Nursing and Midwifery Directorate, HSE to provide this particular Module to nominated Psychiatric/Mental Heath Nursing Staff from the Mental Health Services nationally. 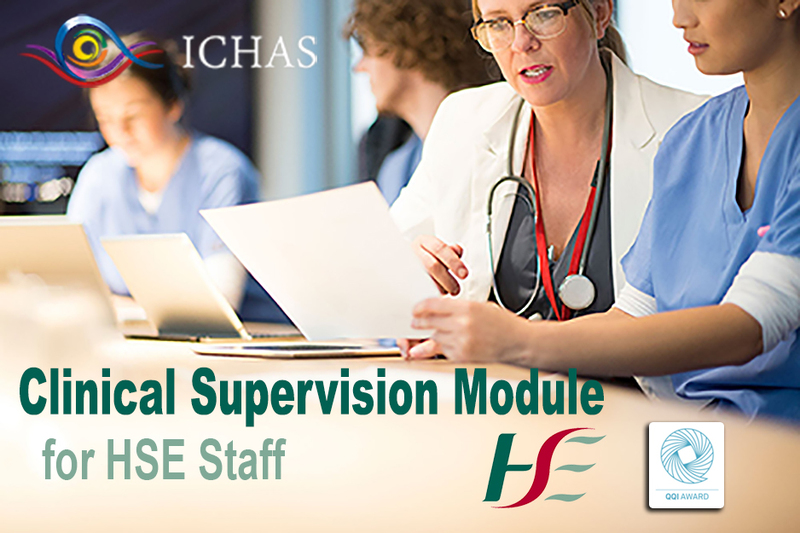 This course will support HSE staff to enhance their knowledge of the practice of Clinical Supervision. The course is, in fact, one of the Modules from the M.A in Clinical Supervision in Professional Practice offered by the Irish College of Humanities and Applied Sciences. The MA is awarded by Quality and Qualifications Ireland (QQI) and where individual modules are completed (as in this case) students who successfully complete the module, will be awarded a Single Subject Certificate by QQI. The course is structured as a ‘Blended Learning’ Module. That effectively means that we utilise the best of technological advances to support your learning and combine both on-line resources with face to face teaching using both asynchronous and synchronous approaches. The rationale for the approach, as well as instructions, guidance and support to prepare you for the use of the technology are contained in this section. In brief, though, it is expected that you will engage with some podcasted lectures as well as 18 hours of real time teaching which is delivered over three days. The online material will be made available at the commencement of each week and attendance is required (mandatory) for the three days. A full calendar is also available on our student portal, so please refer to that for dates and times of teaching as well as the means of teaching and venue as appropriate. For the web-based asynchronous learning, lectures may be taken at your own time and will be available for re-viewing throughout the Module. There is also one ‘synchronous’ online tutorial (please refer to timetable for the specific date). This means that if you wish to attend that tutorial you MUST do so at the time scheduled. It will not be repeated or available as a recorded session after it has been completed. There is an assessment associated with the module, which will comprise an essay (70%) as well as class participation and reflective assessment (30%). On successful completion students will have earned 5 ECTS and will be eligible for a Single Subject Certificate from QQI in recognition of their attainment. Students will also be eligible to register for and complete either other similar Modules from the MA programme in Clinical Supervision in Professional Practice with ICHAS on a similar stand alone basis or register for and complete the entire Masters programme. The Module teaching and assessment strategy has been designed to help you balance the requirements of a busy professional working life and the commitments you have in terms of home, life and study at the same time. We look forward to working with you in the journey through this course and wish you well in your studies.